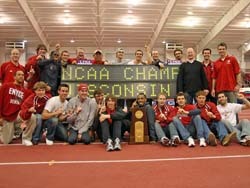 The Wisconsin men&apos;s Indoor Track & Field team (pictured) captured the 2007 NCAA Indoor Championship over the weekend. The Badgers scored 40 points to win its first NCAA title in track and Field and the first ever for a Big Ten Conference school. "It proves if you coach long enough, anyone can win," said UW coach Ed Nuttycombe. "We&apos;ve been in the top 10 and top four but this is the first time we&apos;ve won it all. This year we were able to get enough people in the same place at the same time to get it done.